LIVE YOUR DREAM in this tropical island WATERFRONT paradise! Enjoy BREATHTAKING SUNRISES over the Tampa Bay and the Sunshine Skyway. Catch fish right off the seawall and watch the dolphins and boats sail by. Spend a quiet afternoon RELAXING at the community pool. The unique layout of this three level town home provides the feel of being in a home. Enter PARADISE through the inviting foyer and take your private elevator or spiral staircase to the open and beautiful living areas. French doors lead to balconys on both sides of the townhome where you can feel your stress level decrease. A romantic fireplace adds to ambiance. The GOURMET KITCHEN is stunning and features extensive CUSTOM MADE CABINETRY, unique GRANITE countertops, SS APPLIANCES including a custom range hood & silent Bosch dishwasher. A large dining area seats many guests and there is plenty of cabinet space. Perfect for entertaining! There is also a COVERED SCREENED LANAI for you to enjoy your morning coffee. These townhomes are poured concrete construction from top to bottom not like most on the island which are wood frame construction. BRAND NEW A/C installed August 2018. Included in the monthly maintenance fees is hazard and flood insurance for the building. 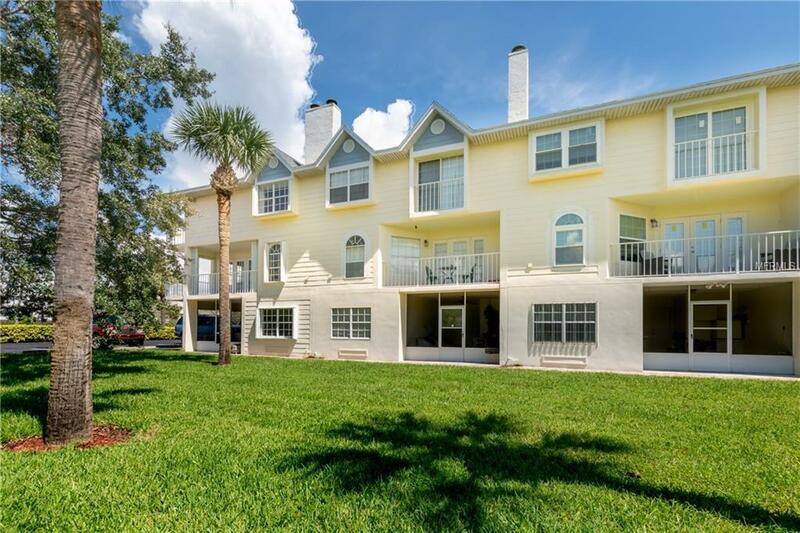 This townhome is perfect for all boaters/sailing enthusiasts, people that love to fish or anyone that wants to live the waterfront dream. Local restaurants and waterfront venues makes this the ideal home for anyone who wants to live the Florida lifestyle. Motivated sellers! Amenities Additional Fees Hoa Fee includes The Required insurance For Wind And Flood That Lenders Will Require. It Covers The Outside Of The Building And Structure For All Damage From A Storm And Liability. Pet Restrictions Dogs And Cats Permitted 40Lbs Or Under. Buyer Responsible For Confirming info With Hoa.